Wyandot's professional, Francis Marzolf knew she was something special as soon he started giving her lessons in 1929. Extremely erratic, but man, could she ever murder a driver! Right from the beginning, Isabel Emmons' natural athleticism enabled her to blast her tee shots past most of the male players at Wyandot. According to Francis, her drives would travel 215 to 250 yards. Much like Babe Didrickson, she excelled at all athletic endeavors. Isabel's best skill was tennis; she had won the city championship! But once she committed to golf, the other sports fell by the wayside. The Citizen's Lew Byrer happened to be visiting Marzolf just after Francis took over the Wyandot (then Elks') club pro job in '29. Isabel was not yet breaking 100 consistently, yet the pro had observed sufficient talent that he mentioned to Byrer, "I've a woman pupil up here who is going to be heard from in tournament circles. She has the distance right now and her accuracy is improving. And- best of all- she loves to play and loves to practice." And how! Once hooked on the game, Mrs. Emmons could be found at Wyandot every day that it was playable. Often, she played 36 holes. She obtained frequent lessons from Marzolf, and supplemented those with tutelage from Charlie Lorms at Columbus Country Club. As Francis had foretold, her game skyrocketed. By 1930, only her second year of golf, Mrs. Thornton Emmons (like most women of that era, Isabel used her husband's name in competition) posed a legitimate threat to win the local championship. She made the final of the women's Franklin County Amateur that year before bowing to Mrs. Curtis (Blanche) Sohl, playing out of Scioto. Isabel made another run at the Franklin County event in 1931 before being turned away again by Mrs. Sohl in the quarter-finals. Elks'-Wyandot had earned the label "Maker of Champions" due to the sensational string of Ohio Amateur titles earned by its crack male stars from 1927 to 1932. The dominance of the Wyandot men waned after Johnny Florio's 1932 Ohio Amateur victory. But the Wyandot women, led by Mrs. Emmons, immediately began picking up the slack with their dazzling performances. 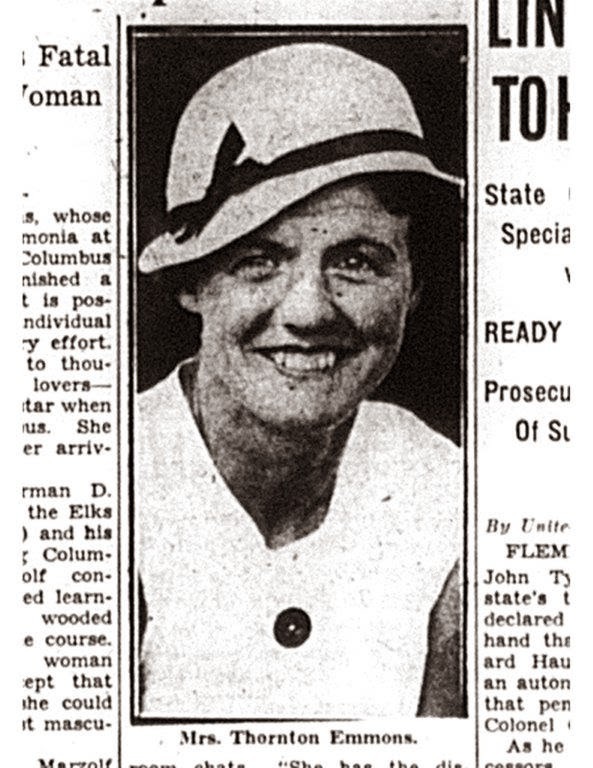 Mrs. Emmons raised her game several notches by lapping the field when she equaled Columbus Country Club's women's par of 81 in the qualifying round of the 1932 Franklin County Amateur. Finishing a very distant second was her arch-rival Mrs. Sohl who carded an 89. Isabel's form held through to the final where she confronted Blanche Sohl once again. This time Isabel turned the tables. Outdriving Sohl by 25 to 40 yards, she never trailed. She closed out the final 3 and 2 by canning a 20 foot birdie putt on the 16th. Mrs. Emmons decided in 1933 to make her debut in the state amateur at Akron's Portage Country Club. The blond curly-haired wife and mother of two raised eyebrows by taking out Mrs. Sohl, the 1929, champion in the second round. Mrs. Emmons followed up that victory by knocking off defending champion Mrs. Larry Nelson in the quarter-final match. After dusting off Mrs. Hoyt Smith in the semis, she faced Mrs. Linton Fallis of Toledo in the final. The 36 hole final match was a tense affair, chocked with drama. In an early hole, a controversy ensued. Mrs. Emmons' caddy followed her into a bunker and then set her golf bag down on the sand. Convinced that this was an infraction, Mrs. Emmons called a penalty on herself which Mrs. Fallis refused to accept. An official was called; he ruled there was no penalty. Mrs. Emmons did not argue, but intentionally took the wrong club out of the bunker and sent the ball far across the green- effectively assessing the penalty stroke she felt was required to take by the rules of golf. The lead see-sawed back and forth all day with Mrs. Fallis's fantastic putting compensating for comparatively short hitting. On the 35th hole, the feisty Mrs. Fallis's par 3 catapulted her into a one-up dormie lead. Mrs. Emmons heroically responded with a high- pressure brassie shot to within 12 feet of the 36th hole to square the match. On to the first hole (37th of the match)! Having to play this hole for everything caused Mrs. Emmons great consternation. She was superstitious- you see- and apparently thought it a bad omen to win the first hole. Twice during the week, she had intentionally missed putts to win the first. She overcame this unusual phobia by splitting the fairway with her "rifle-like" long drive, and then striking a smooth mashie-niblick fifteen feet from the pin. Her resulting par was good enough to take the title. 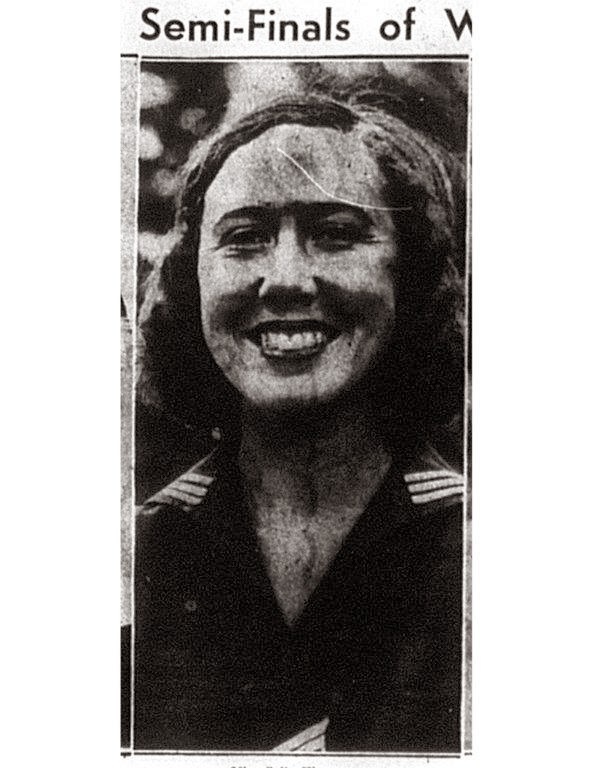 Mrs. Thornton Emmons had won the Ohio State Amateur in only her fifth year of playing golf. Afterwards, the press expressed bemusement at Mrs. Emmons' approach to tournament golf. She didn't particularly like it. It was way too serious; she felt the game should be fun. Isabel preferred playing casual rounds with her husband or friends. Lew Byrer commented, "I'm not sure she isn't right. For golf, after all, is played for the love of the thing. And tournament players I have watched seldom seem to be having much fun." 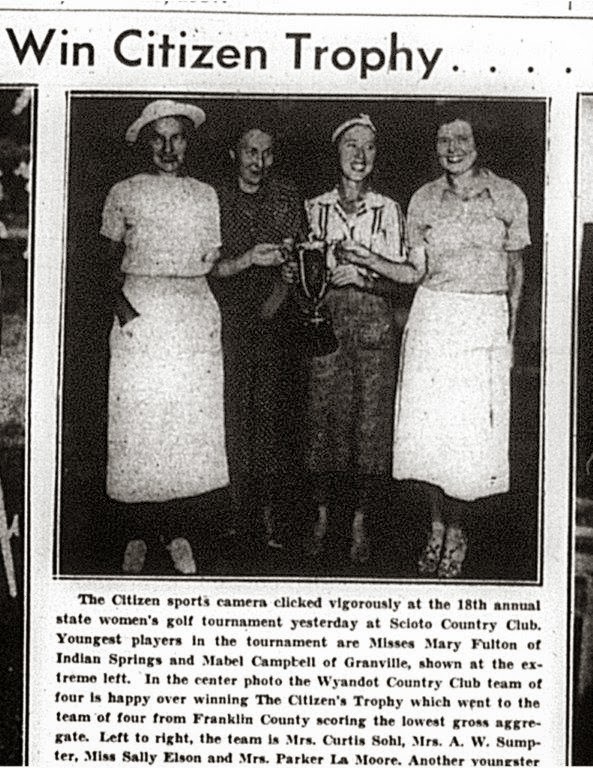 Mrs. Emmons repeated her Franklin County Amateur triumph in 1934. In an amazingly brief period of time, she had shot past her Franklin County rivals to become the undisputed queen of Columbus golf. Only 35 years old, it seemed certain that Isabel would dominate the women's golf scene for another two decades. She wasn't the only excellent Wyandot woman player. Young Sally Elson and Miss Chester (yes, that was her given name, not some husband's) Skees were beginning to make their marks. Perhaps operating under the theory that, "if you can't beat 'em, join 'em," Mrs. Sohl, also joined Wyandot. Surely, Emmons, Sohl, Elson, and Skees would form an unbeatable quartet in club team play for years to come. Shortly after New Years Day, 1935, Mrs. Emmons became ill. She came down with pneumonia, and suddenly her condition was grave. 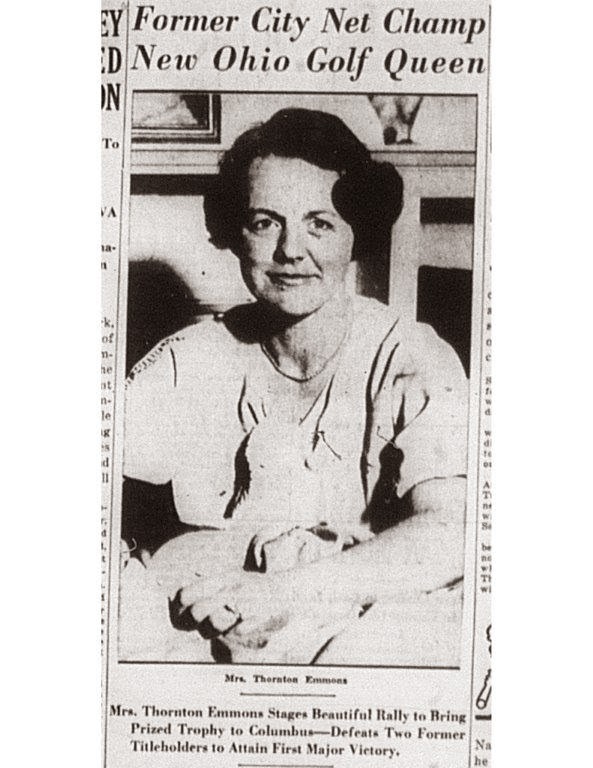 She succumbed to the illness on January 15th, leaving behind husband Thornton, a vice-president with American Zinc Sales Co., and children Virginia and George. Her passing made front page news. The Journal's Ed Peniston penned the following emotional homage: "It is a calamity when any city loses its best woman athlete, as did Columbus when it lost Mrs. Thornton Emmons, Monday. But it is a stark tragedy when it loses a woman whose sportsmanship was even more outstanding than was her ability as an athlete. It is easy enough to say of one who has passed on that he or she was the community's best sportsman or sportswoman. Nobody will dispute it then. But I know that if one had asked any woman golfer in Columbus last week or last month or last year who was our foremost sportswoman, and they would have as unhesitatingly answered 'Isabel Emmons'......A city can replant a tree which has fallen before a hurricane. It cannot replant examples of sportsmanship. They are born not made. They come but once, perhaps, in many generations." Sorrowful over the loss of their friend and leader, the Wyandot women evidently determined that the best way to honor Isabel's legacy would be to rack up more tournament wins for Wyandot. The petite comely Miss Elson kept the county amateur in the club's hands when she won the title for the first time in 1935. 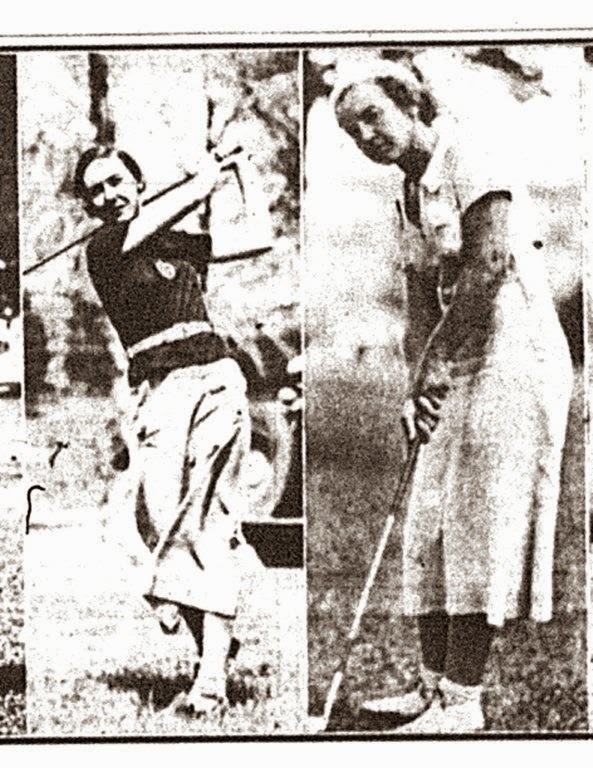 In '36, Sally, Blanche and Chester made it three Wyandot golfers out of four in the semis of that year's county championship held at Columbus C.C.. Skees took down Elson one-up to advance to the final against Blanche Sohl. Mrs. Sohl won the title for the seventh time with a 4 and 3 triumph. Sally consoled herself by setting the Elks'-Wyandot women's course record in September with a 75. It could have been an even better round, but she took 6 on the easy 17th. She built on that achievement by rebounding to win the county title in 1937. Led by Sally, along with additional reinforcements Mrs. Parker La Moore, Mrs. A. W. Simpson, and Mrs. A. 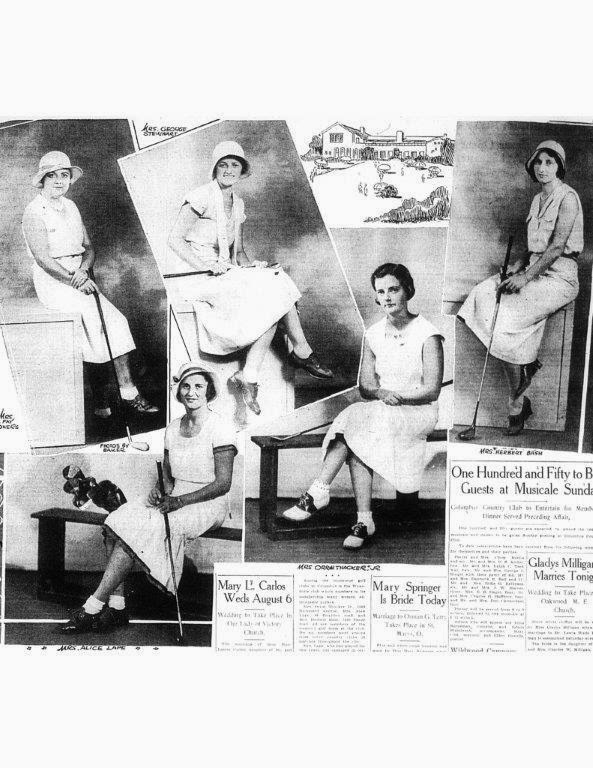 Ward Sumpter, the Wyandot women's contingent, descended upon Scioto to compete in the 1937 Ohio State Amateur. In addition to striving for individual honors, the club's women wanted to win "The Citizen's Trophy" which would be awarded to the club whose four players scored the lowest gross aggregate in the qualifying round. It was no surprise when the Wyandot women swept this team competition. This victory followed on the heels of the team's dominating performance in the Private Club Interclub Championship. Sally, enjoying a blazing hot streak, marched her way into the finals against Miss Isabel Ogilvie of Cleveland. Before the match, Sally placed a four-leaf clover in one of her shoes. However this seemed to backfire as she suffered the bad luck of being victimized by several stymies. The normally effervescent Miss Elson kept a poker-face as momentum in the 36 hole final shifted first toward Miss Ogilvie then back to Sally. Finally on Scioto's 11th (the 29th of the match), Sally , employing her "Mills head" wooden shafted putter, stroked a putt for birdie from 30 feet. When it dropped, she broke out in "a smile as wide as the Grand Canyon from ear to ear." She followed that bomb with another 15 footer on number 12 to win that hole as well. She ran out the match 4 and 3. Interviewed thereafter, Sally confided, "I felt [after the 30 footer on 11] then that I was going to win the match. That putt bothered Isabel and gave me back my courage." The women's terrific play in the '30s rivaled the achievements of the Elks' men in the "Golden Era" from '27 to '32. While the women did not win any more state titles, one of them received a special honor. 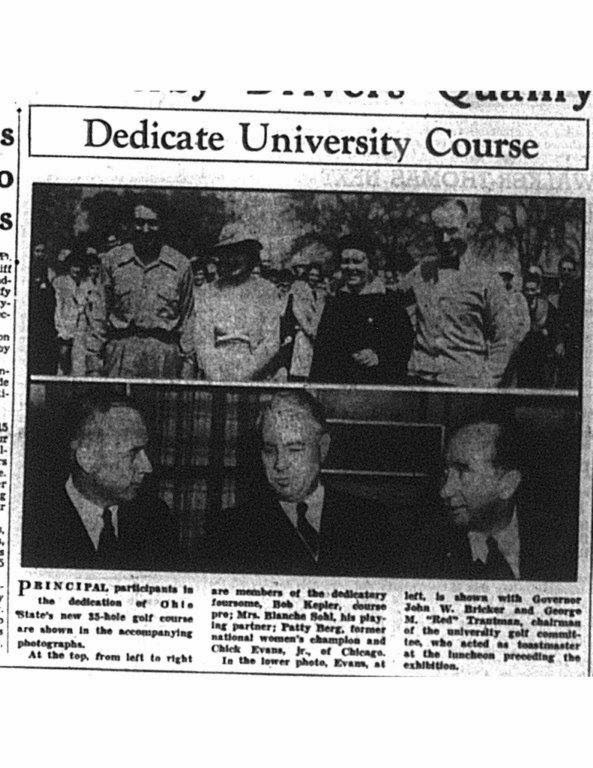 Blanche Sohl, now a golf instructor in Ohio State's athletic department, was invited along with OSU coach Bob Kepler to play the May 18, 1940 opening round at the dedication for OSU's two new golf courses. Filling out the day's foursome would be golf legends Chick Evans and Patty Berg. As was nearly always the case for the esteemed Wyandot women of the 1930's, Mrs. Sohl acquitted herself well in the heady presence of great players. In her capacity as an OSU instructor, Mrs. Sohl did such a bang-up job teaching one young woman the game that the pupil became a regular on the Ohio State women's golf team. That Buckeye team won the third Women's National Collegiate Championship in 1947. The student in question was Ellen Marzolf (yes - Francis's daughter). Maybe because she had the game all around her growing up, Ellen resisted playing until signing up for Mrs. Sohl's golf class. Blanche's imparted wisdom propelled Ellen Marzolf Hellerman into a lifetime love of golf. Acknowledgements: Tom Marzolf, Ellen Marzolf Hellerman; archives of the Columbus Citizen, Columbus Dispatch, and Ohio State Journal newspapers housed in the Columbus Metropolitan Library.